October 20 is the 293rd day of the year(294th in leap years) in the Gregorian calendar.There are 72 days remaining until the end of the year. Year 1548 (MDXLVIII) was a leap year starting on Sunday of the Julian calendar. Year 888 (DCCCLXXXVIII) was a leap year starting on Monday of the Julian calendar. Zhu Zhen (朱瑱), often referred to in traditional histories as Emperor Mo of Later Liang and sometimes by his princely title Prince of Jun (均王), né Zhu Youzhen (朱友貞), known as Zhu Huang (朱鍠) from 913 to 915, was the emperor of the Chinese Five Dynasties and Ten Kingdoms period state Later Liang from 913 to 923. He was the third and last emperor of Later Liang, the first of the Five Dynasties. He ordered his general Huangfu Lin (皇甫麟) to kill him in 923 when Emperor Zhuangzong of Later Tang, the emperor of Later Liang's enemy Later Tang to the north, was on the cusp of capturing the Later Liang capital Daliang. His death marked the end of Later Liang, which was to be the longest among the Five Dynasties. Despite his ten-year reign being the longest of all the Five Dynasties emperors sources on his era are relatively scarce, as many Later Liang records were destroyed following the Later Tang conquest of Later Liang. The Later Liang, also known as Zhu Liang, was one of the Five Dynasties during the Five Dynasties and Ten Kingdoms period in China. It was founded by Zhu Wen, posthumously known as Taizu of Later Liang, after he forced the last emperor of the Tang dynasty to abdicate in his favour. The Later Liang would last until 923 when it was destroyed by Later Tang. Year 460 (CDLX) was a leap year starting on Friday of the Julian calendar. At the time, it was known as the Year of the Consulship of Magnus and Apollonius. The denomination 460 for this year has been used since the early medieval period, when the Anno Domini calendar era became the prevalent method in Europe for naming years. Aelia Eudocia Augusta, also called Saint Eudocia, was a Greek Eastern Roman Empress by marriage to Byzantine emperor Theodosius II, and a prominent historical figure in understanding the rise of Christianity. 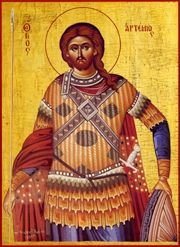 Eudocia lived in a world where Greek paganism and Christianity existed side-by-side with both pagans and non-Orthodox Christians being persecuted. Although Eudocia's work has been mostly ignored by modern scholars, her poetry and literary work are great examples of how her Christian faith and Greek heritage/upbringing were intertwined, exemplifying a legacy that the Roman Empire left behind on the Christian world. Artemius, known as Challita in the Maronite tradition, was a general of the Roman Empire, dux Aegypti. He is considered a saint by the Catholic and the Orthodox Churches, with the name of Artemius of Antioch. Saint Caprasius of Agen is venerated as a Christian martyr and saint of the fourth century. Relics associated with him were discovered at Agen in the fifth century. Local legends dating from the 14th century make him the first bishop of Agen, though, as Alban Butler writes, the only evidence to support his existence is the dedication of a church to him in the 6th century. Saint Hedwig of Silesia, also Saint Hedwig of Andechs, a member of the Bavarian comital House of Andechs, was Duchess of Silesia from 1201 and of Greater Poland from 1231 as well as High Duchess consort of Poland from 1232 until 1238. She was reported in the two-volume historical atlas of Herman Kinder and another author to have been great in war and defended from the Teutonic Knights. She was canonized by the Catholic Church in 1267 by Pope Clement IV. Acca of Hexham was a Northumbrian saint and Bishop of Hexham from 709 until 732. Aderald was a canon and archdeacon of Troyes, France, when he led a pilgrimage to the Holy Land. ↑ Hugh Chisholm (1910). The Encyclopædia britannica: a dictionary of arts, sciences, literature and general information. The Encyclopædia Britannica Company. ↑ Albert Tezla (1970). Hungarian Authors; a Bibliographical Handbook. Harvard University Press. pp. 68–. ISBN 978-0-674-42650-4. ↑ Nicholas Canny; Nicholas P. Canny (12 August 1982). The Upstart Earl: A Study of the Social and Mental World of Richard Boyle, First Earl of Cork, 1566-1643. Cambridge University Press. pp. 78–. ISBN 978-0-521-24416-9. ↑ John Lemprière; Eleazar Lord (1825). Lempriere's Universal Biography: Containing a Critical and Historical Account of the Lives, Characters, and Labours of Eminent Persons, in All Ages and Countries. Together with Selections of Foreign Biography from Watkin's Dictionary, Recently Published, and about Eight Hundred Original Articles of American Biography. R. Lockwood. pp. 177–. ↑ Adrian Tinniswood (2002). His Invention So Fertile: A Life of Christopher Wren. Pimlico. pp. 330–. ISBN 978-0-7126-7364-8. ↑ Fayette Phelps Leach (1932). Thomas Hungerford of Hartford and New London, Conn: And Some of His Descendants with Their English Ancestors. Supplement. ↑ Sylvanus Urban (1864). THE GENTLEMAN'S MAGAZINE. pp. 767–. ↑ Stanley S. Sokol; Sharon F. Mrotek Kissane; Alfred L. Abramowicz (1992). The Polish Biographical Dictionary: Profiles of Nearly 900 Poles who Have Made Lasting Contributions to World Civilization. Bolchazy-Carducci Publishers. pp. 229–. ISBN 978-0-86516-245-7. ↑ Henry Stoddard Ruggles (1897). General Timothy Ruggles, 1711-1795. Priv. print. ↑ George Naylor, The Register's of Thorrington (n.n. : n.n., 1888). Hereinafter cited as Registers of Thorrington. ↑ Norman L. Johnson; Samuel Kotz (26 September 2011). Leading Personalities in Statistical Sciences: From the Seventeenth Century to the Present. John Wiley & Sons. pp. 5–. ISBN 978-1-118-15072-6. ↑ Heinz Dietrich Fischer; Erika J. Fischer (1994). American History Awards, 1917-1991: From Colonial Settlements to the Civil Rights Movement. Walter de Gruyter. pp. 45–. ISBN 978-3-598-30177-3. ↑ Brian Anthony; Andy Edmonds (23 December 1997). Smile When the Raindrops Fall: The Story of Charley Chase. Scarecrow Press. pp. 4–. ISBN 978-1-4617-3418-5. ↑ The Encyclopedia of Country Music. Oxford University Press. 16 December 2004. pp. 923–. ISBN 978-0-19-984044-1. ↑ Scott, Cavan; Wright, Mark (2013). Doctor Who Whology: The Official Miscellany. London: BBC Books. p. 120. ISBN 9781849906197. ↑ Rose, Mike (October 20, 2018). "Today's top celebrity birthdays list for October 20, 2018". The Plain Dealer. Retrieved October 20, 2018. ↑ FashionModelDirectory.com, The FMD -. "Elyse Taylor - Fashion Model - Models - Photos, Editorials & Latest News - The FMD". The FMD - FashionModelDirectory.com. ↑ "Senior List". Essendon Football Club. Retrieved 4 October 2018. Wikimedia Commons has media related to October 20 .